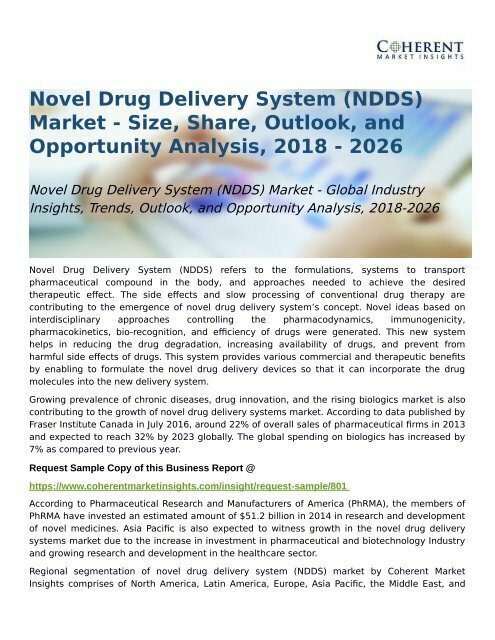 Novel Drug Delivery System &#40;NDDS&#41; refers to the formulations, systems to transport pharmaceutical compound in the body, and approaches needed to achieve the desired therapeutic effect. The side effects and slow processing of conventional drug therapy are contributing to the emergence of novel drug delivery system’s concept. Novel ideas based on interdisciplinary approaches controlling the pharmacodynamics, immunogenicity, pharmacokinetics, bio-recognition, and efficiency of drugs were generated. This new system helps in reducing the drug degradation, increasing availability of drugs, and prevent from harmful side effects of drugs. This system provides various commercial and therapeutic benefits by enabling to formulate the novel drug delivery devices so that it can incorporate the drug molecules into the new delivery system.